As we have seen, the 1917/18 London Combination season was something of an up and down league from Arsenal’s point of view. By the end of February Arsenal had won 13, lost 10 and drawn five of their games in the league. Most frustratingly, there had been no sense of putting a run together since the opening weeks of the season when Arsenal won four in a row. On Easter Monday, 1 April Arsenal played their return fixture against West Ham, the crowd was 7000. Arsenal lost 1-3. One explanation for the low crowd was of course Arsenal’s form, the club have won one and lost five in the last six – and that runs shows what an extraordinary turn around given that in the four games across the last two weeks of February and first two of March wherein Arsenal had not only won four games in a row they had done so scoring 17 and conceding just two. But also of course the war was continuing, and more and more men were being conscripted to fight on the European front – an issue that came to dominate this month. Meanwhile on the war front, the German offences noted in the last article were beginning to peter out through the lack of supplies and now, almost a century later, one can only assume that the people who thought up the scheme were either desperate or inept. Or quite possibly both. The German numbers were depleted, the new territory they occupied was of little significance, and they were ready to be picked off at any moment of the Allies choosing – except that until more Americans arrived, the Allies were running out of troops. 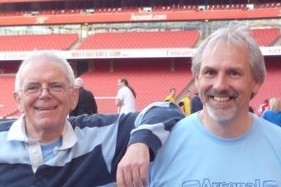 On 6 April Arsenal played their final match of what as we have seen was for the most part a disappointing season losing 1-2 away to Fulham in front of 2000. The result meant Arsenal finished fifth in the league of 10, having won 16 and lost 15 games. I’ll give the full league table in the next post, when the season is summed up, as has been done for each of the war league years. The football was, however, not completely over, for on Saturday, 13 April a secondary series of four matches was played by a number of clubs to raise money for the National War Fund in what I believe was called the National War Fund Cup. Details of these games are hard to come by but we do have the full records of two London clubs at this time: Arsenal and Chelsea. Across the four Saturdays beginning on 13 April Arsenal played Millwall home and away and then Brentford home and away, the games taking the clubs through to the first Saturday in May – the date on which the season had ended in the previous war time seasons. At the same time Chelsea played a similar pattern of four games, first two against Tottenham and then two against West Ham. I imagine both Tottenham and West Ham, as well as Arsenal’s opponents, Brentford and Millwall also competed the four fixtures, quite possibly with Tottenham playing WHU twice and Brentford playing Millwall twice, but I have not found the records. Nor do I know if there actually was a trophy. The minutes of the board of Everton FC for the period also include a short reference: “An application for the use of the ground on Apl. 13 by the L’pool County F.A. for a match in aid of the Football National War Fund was granted subject to alteration of date to May 11th.” There are no more details. Likewise, the book “A record of British Wartime Football” has a reference to the War Fund Shield, but again without further details. So we know it was there, but how the games were chosen, we don’t know. However thanks to TheArsenalHistory we do have the records of the matches for Arsenal, and the first game was a 4-3 home win against Millwall Athletic with 3,500 in the crowd. Arsenal did use the sequence of four games to introduce four new players to the squad – perhaps trialling them for the next season, but for Brown, Cooper and Robinson their one game in the National War Fund games was their one and only match for Arsenal. On 17 April, the Council of the Borough of Fulham did as it had done in each of the previous years, and asked journalists to leave the chamber while they debated the salaries of council officials. It is from a report of this matter that we learn that the gravediggers, who had threatened to go on strike, and achieved their aims and got an increase in their wages and were continuing their essential service. Meanwhile the second game in the war fund competition was played: the return match of the first, and on 20 April Arsenal beat Millwall away, 1-0, with an identical crowd (3,500). It is also interesting at this time to note that on 23 April Sir Henry Norris missed another meeting of the London County Council. He had, during his time on the Education Committee, been missing their meetings quite regularly – and clearly was excused this lapse by the council because of his War Office work. But to miss two meetings of the full Council – that had not happened before. He may of course have been ill, but it is more likely that he was involved in discussions in relation to what became known as the Conscription Crisis. 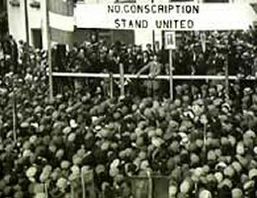 Since the introduction of conscription in 1917, Ireland (all of which of course at this time was under UK control) had been excluded although very significant numbers of people in Ireland had volunteered. But in April 1918 the government (which of course in terms of implementation of policy meant the War Office where Lt Col Norris worked) had prepared to introduce conscription in Ireland. Trades unions, the Irish nationalists political parties, and many Roman Catholic bishops and priests objected most strongly, and although the Act had been passed to enforce conscription in Ireland, it had until this point never been implemented. Now however the government needed more men urgently. But the Irish were not going to accept this move. On 18 April 1918 Lord Mayor of Dublin convened the Irish Anti-Conscription Committee which was convened to devise plans to resist conscription, and that evening the Roman Catholic bishops’ annual meeting declared the conscription decree an oppressive and unjust law, calling on the Church’s adherents to resist “by the most effective means at our disposal”. An anti-conscription pledge was to be taken at the church door of every Roman Catholic parish the next Sunday, 21 April. A one-day general strike was called in protest, and on 23 April, and all work stopped, even in the government’s munitions factories. Such a strike had never happened before and was followed by rallies across Ireland. There was, as can be imagined, considerable dismay and alarm in Whitehall. But although this situation occupied the government greatly, it did not affect the people of London directly, and so football continued, and the the final game of April was played: a 3-1 home win over Brentford on 27 April, and once again the crowd was identical – 3,500. But life in London continued and on 24 April Sir Henry was at the regular London Borough of Fulham council meeting in which air-raid shelters and and waste collection were discussed. The former represented a new idea, for the notion of enemy aircraft flying over London and dropping bombs had been new at the start of the war. The latter topic (waste disposal) had been ongoing, and was reaching a crisis point because of the lack of refuse collectors – “dustmen” as they were known then, and for decades to come. Apparently the Borough of Fulham had got hold of some pigs to eat the waste collected from the local greengrocers. News was also starting to appear in the papers that there was a major battle being fought in Flanders: as Germany tried its final push to overrun the region before the Americans forced them back. With this going on there was a huge pressure on Sir Henry’s department to provide more men (as noted above with the ill fated attempt to conscript in Ireland), and as he started to miss local council matters too, his wife Edith taking his position in some civic duties outside the council chamber. The final Arsenal game of the month was a 3-1 home win over Brentford on 27 April, and once again the crowd was modest – 3,000 this time. And staying with the football, although this article concerns April 1918, I will include the final match of the season – on 4 May, in which Arsenal played the return game against Brentford, Having won the previous three NWF games Arsenal however couldn’t make a clean sweep, merely drawing 1-1. I wonder if three wins and a draw was enough to win the Cup. If there was a Cup, that is. Here are the results for the final month of the season. The West Ham and Fulham games finished the London Combination league programme.